The CPH POST recently interviewed the ambassador for the spring issue of the Diplomacy magazine. You have a PhD in economics. That seems a slightly unusual route on the road to becoming a diplomat. Could you explain how you ended up in the diplomatic service? I’ve already been working in the diplomatic service for over 14 years. During my studies, I was fascinated by the international political economy, the study of interactions between markets and politics, the influence of markets on politics and the influence of policy on markets. At the same time, we were and are witnessing a shift from classical diplomacy towards areas like security, energy and, of course, the economy. Nowadays, all countries have a strong focus on economic diplomacy. Also, the staffing of the foreign service was adapted accordingly. We have a lot of economics graduates working in our foreign service and I do not see that being a diplomat is necessary linked to a specific qualification. So, an academic background in economics is by no means unusual in the foreign service in Romania and other countries. Nevertheless, I see my current mandate as a sign of confidence in my capacity to successfully fulfil Romania’s objectives in its relations with Denmark – an incentive to reach ever more ambitious targets in my work. Fostering Romanian-Danish economic partnerships is one of the prime concerns in my current mandate. After 100 years of bilateral diplomatic relations, celebrated this year, it is both challenging and gratifying to contribute to resetting the foundations of our co-operation based on our successes to date and common interest in consolidating and diversifying our economic collaboration. I am committed to achieving another milestone in the area of economic partnerships and thus intend to use all the instruments available in the diplomatic toolbox, including my expertise in this field. 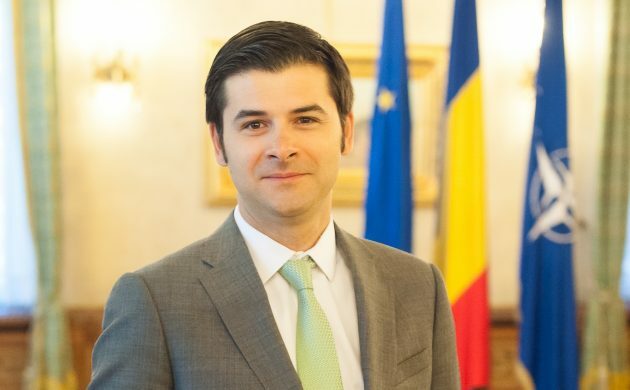 How would you describe a typical day as Romanian ambassador – if there is such a thing? I do not believe that there is such a concept as ‘Romanian ambassador’. I think that the majority of ambassadors have similar agendas of course – having in focus issues of immediate interest for each specific country. A typical day starts at 08:30, going through the correspondence and having individual discussions with the staff members in charge of different departments in the embassy. Throughout the day there are a lot of events – high level conferences, seminars – where my attendance is required. I meet a lot of different Danish officials, members of Parliament, fellow ambassadors; there are a lot of different lunches to be attended. There are also a lot of evening events, such as concerts, films or dinners that can often extend the daily program until 9 or 10 pm. On one point, Denmark is rather unique – there are not a lot of evening commitments compared, for example, to Austria, where I served before coming to Denmark. I know that you are married with two daughters. What do your wife and family think of living in Denmark? Do you and they have Danish friends who they socialise with? I met my wife when we were both in the foreign service twelve years ago. Back then lived in Bucharest and she was responsible for bi-lateral relations between Romania and the Nordic countries, amongst which were Denmark and Iceland, countries where now I am accredited as ambassador. Her Danish story began long before mine. In those six years she made her first friends that she has now met up with again, and she fell in love with the Scandinavian simplicity. She believes that ‘less is more’, and the perfect place to enjoy that is Denmark. We have two young daughters, Ana Sophia and Alexa Ingrid, and for them, living in the country of the Little Mermaid and the Little Match Girl was a lot easier that we expected. Of course, Ana already knew most of the stories written by Hand Christian Andersen, and moving to Copenhagen seemed somehow natural. At the same time, they are very much enjoying the kindergarten and soon the first of them will start school here – a moment that all parents await with a lot of emotion. Although we have been here less than six months, I think we are extremely lucky to have already made so many friends, and we are looking forward to experiencing as much as possible the Danish lifestyle that I find so attractive, especially for the families with children. What story would you, as Romanian ambassador, like to tell Denmark about Romania? I suppose many Danes are familiar with tales about Romania from long ago. However, I would like to encourage Danes to become familiar with contemporary Romania. It is the story of a young democracy which, nevertheless, proves resilient in the face of many challenges, quite visible in the populist trends throughout Europe. It stands out through its dynamic economy – the fastest growing in the EU – and its ever-consolidating civil society, increasingly receptive and active in supporting democratic values at a time when these are more and more contested. I also want to mention that Romania is becoming an IT hub for a lot of companies and currently has the fastest download speed in Europe. I would encourage Danes to visit Romania and enjoy its natural beauty and its rich culture. But Danes can also learn about Romania through their dialogue with Romanian nationals in Denmark, who are well-integrated, hard-working, ambitious and resourceful individuals. This is not a fairy tale or a legend. The people are friendly and exceptionally good at accepting foreigners. We also have a lot to offer when it comes to tourism. A journey of a few hours by car or train can take you from the unique River Danube to a beautiful, intact, medieval town in Transylvania; from Bucharest – Romania’s capital city – to the Black Sea, with its sun-kissed beaches; from Southern Transylvania to Bucovina or Maramures. Take a step back in time as you visit one of the world-famous painted monasteries in Bucovina (part of UNESCO heritage), the ancient, hilltop citadel in Sighisoara or an authentic, centuries-old, folkloric village in Maramures. We also invite you to savour delicious traditional dishes and wines with unique bouquets! What do you think you can learn from Denmark? Despite only recently moving to Denmark, my mandate has allowed me to enjoy some of the most enriching experiences. What I’ve found inspiring so far is the Danes’ innovative and entrepreneurial spirit, which allowed a country with a population of just 5.5 million people to establish world renowned brands – LEGO, Novo Nordisk, Moller-Maersk or Vestas – and to contribute to the prosperity of communities worldwide. Of course I can continue: Danish design and architecture, Denmark’s expertise in renewable energy and energy efficiency, new Danish technologies in agriculture and the food sector, Danish education and healthcare, as well as transportation using bicycles! One last thing. Several times Denmark has been awarded the title of ‘the world’s happiest country’ and I believe that aside from the obvious reasons for this success (Danish welfare system), there are some other things to be considered, like the ‘Jante Law’, which governs the Scandinavian countries above any other law or constitution. Moreover, successfully promoting Danes’ lifestyle abroad to the point that foreigners adopt it and understand the meaning of ‘hygge’ is an accomplishment in itself. Finally, when you are ‘off duty’ what hobbies and interests do you have? I like to spend time with my family, watch movies and football matches together, go out with them and with other friends to restaurants, concerts and other public events. I’m very fond of playing football, skiing, playing tennis and running marathons. Recently, I started training for the Copenhagen Marathon. In November last year I participated with the embassy team in a diplomatic football tournament here in Copenhagen, and back in Bucharest, I was the captain of the football team of the ministry of foreign affairs! Of course, I’m also very fond of reading (hard copies of books!) and I like to travel. I’m lucky that this is part of my job, but it’s not only business; before this, I have also travelled to a lot of countries around the globe. Ambassador, thank you for your time.